One of the most resilient social activists of the 20th century, Dolores Huerta devoted her life to justice, long after she co-founded the United Farm Workers Union (UFW). 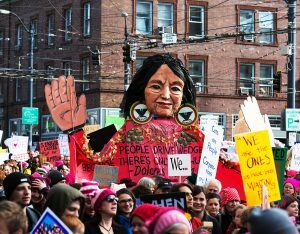 The expansion of holidays commemorating Dolores Huerta as a champion of farm workers and women’s rights comes as her on-going efforts continue to ripple through today’s landscape. You can see Huerta’s influence in the dramatic increase in the number of women and Latinx elected to political office and rise in concern over the treatment of migrant workers and pesticide exposure. A respected and decorated activist, Huerta is a Presidential Medal of Freedom recipient and remains dedicated to her lifetime-long crusade for civil rights today at the age of 88. This year marks the establishment of several holidays to honor her legacy. The City of Houston named March 31, traditionally reserved for César Chávez, for both of the co-founders of the UFW – Chávez and Huerta. In California, April 10 has been dedicated Dolores Huerta Day, as tribute to her enduring strength in the fight for women and farm workers’ rights. To this day, Huerta continues to advocate for the reflection of America’s growing ethnic diversity in public office. As a member of the Feminist Majority Foundation, she led the 2002 Feminization of Power campaign promoting the participation of Hispanic women in public office at the local, state, and federal levels. Dolores Huerta’s continued efforts have indisputably helped break records and pave the way for many in recent elections. According to TIME, 2018 saw the highest number of women and ethnically diverse candidates elected to public office in American history. Learn about the women who make Waters Kraus & Paul. As a co-founder of the National Farmworkers Association, which later became the UFW, Huerta spent three decades advocating for safer working conditions for farm workers, reducing harmful pesticides, and demanding unemployment and healthcare benefits for workers. Perhaps her most famous call for reform was the 1965 Delano strike of 5,000 grape workers, giving birth to César Chávez’s Grapes of Wrath speech. Her tactful negotiations set precedents in California’s state labor laws and farming industry still widely recognized today. These precedents include winning Aid To Families For Dependent Children (AFDC) and disability insurance for farm workers in California, as well as the California Agricultural Labor Relations Act of 1975. Studies have also shown that some agricultural pesticides have harmful effects on the body, including decreased fertility, spontaneous abortion, stillbirth, and developmental abnormalities. Farm workers depend on farm owners and labor contractors to provide a safe working environment.